1. Few foods make me happier than french fries. 2. I had a terrible stutter as a child and teen. 5. My first job was making architectual models. 6. I was a record-holding swimmer in school. 7. I'm a bit of a clean freak. 8. I never keep my shoes on in my apartment (but you can). 9. 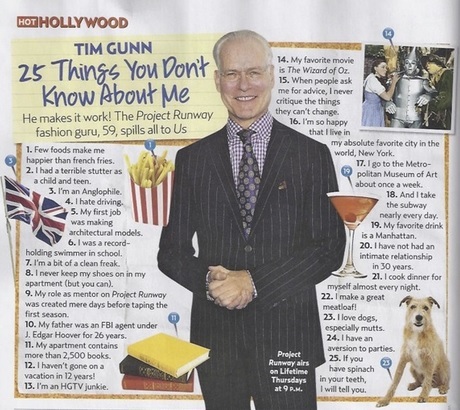 My role as a mentor on Project Runway was created mere days before taping the first season. 10. My father was an FBI agent under J. Edgar Hoover for 26 years. 11. My apartment contains more than 2,500 books. 12. I haven't gone on a vacation for 12 years! 13. I'm an HGTV junkie. 15. When people ask me for advice, I never critique the things they can't change. 16. I'm so happy that I live in my absolutely favourite city in the world, New York. 17. I go the Metropolitan Museum of Art about once a week. 18. And I take the subway nearly every week. 19. My favourite drink is a Manhattan. 20. I have not had an intimate relationship for 30 years. 21. I cook dinner for myself almost every night. 22. I make a great meatloaf! 23. I love dogs, especially mutts. 24. I have an aversion to parties. 25. If you have spinach in your teeth, I will tell you.